It's been a while since I've done an update to the WMRR, busy with life and other things, so here's a bit of an update. It's been a busy month. Apart from returning to work I've managed to make and install some more signals. I'm also working on an infra-red car detector for RHJ Rail and have started the netlists for making the circuit boards. Finally, I've speed matched my locomotives, for the most part. The Katos run fast and had to be slowed down considerably on their speed tables. Some track cleaning has occurred too, DCC is sure finicky about dirty track. *Update July 2006* There have been changes to the WMR. In November 2005 my wife and I moved into a house from a townhouse, so the railroad had to move too. This allowed for some changes to the line to make it a little larger and ease some curves. The virtual tour link below is the WMR as it is now, to see the old WMR click here. 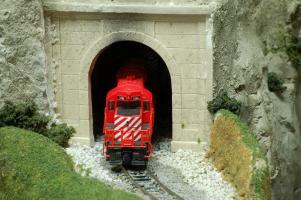 This is a new of my larger blog dedicated to my model railroad. I will be using this for providing updates and thoughts on the West Mountain Railroad. This supplements the main WMRR site in that it allows quick and easy commenting on my part, without major web space writing. Feel free to look around the West Mountain Railroad or if you've come here from there, the rest of my blog.